Beyond Emma Peel: A new BBC collection highlights Diana Rigg's performances in everything from sketch comedy to the plays of Henrik Ibsen. Diana Rigg is best known, in the US at least, as the definitive Emma Peel in the '60s cult television program The Avengers. Splendid as she was in that role, it's hardly her only accomplishment: in fact she enjoyed a long and successful career which included extensive stage and movie work as well as roles in numerous other television programs. 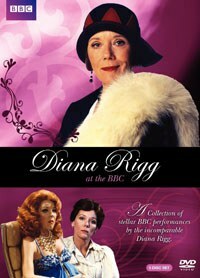 Diana Rigg at the BBC offers 780 minutes worth of her performances in BBC programs on five discs and, if nothing else, pays tribute to her extensive range. The programming itself is a mix of the good, the average and the best forgotten, not surprising given the ephemeral natural of television, so this collection will appeal primarily to fans of Rigg and to those who just can't get enough of British television. The classiest item in this collection is the BBC production of Ibsen’s Little Eyolf, aired in 1982 as part of the Play of the Month series. It features Rigg as Rita Allmers, Anthony Hopkins as her husband Alfred, Timothy Clark as their crippled son Eyolf, and Peggy Ashcroft as the Rat Wife, a sort of female Pied Piper who has the power to entrance humans, as well as rats. Unexplained Laughter, adapted by Alan Owen from a novel by Alice Thomas Ellis and originally broadcast in 1989 as part of the Play on One series, also holds up fairly well today. It stars Rigg as a prickly journalist taking a vacation in Wales in order to recover from a failed love affair. Musical theatre icon Elaine Paige plays her conventional and somewhat annoying companion while the story’s central mystery concerns some strange laughter which only Rigg’s character can hear. The seams are showing quite a bit more in Genghis Cohn, a black comedy adapted from a novel by Romain Gary, which aired in 1993 in the Screen Two series. The problem with this adaptation is that the tatty production values don't do justice to the seriousness of its subject matter, which concerns a former Nazi officer (Robert Lindsay) who has claimed a respectable place in post-war Germany by concealing his past. Anthony Sher plays a Jewish comedian whose execution was ordered by Lindsay's character and who returns as a ghost to haunt him, while Rigg has a supporting role as an attractive baroness who knows what she wants and how to get it. Most of the comic sketches in the series Three Piece Suite, which aired in 1977, have not aged as well. Still, you have to admire the versatility of Rigg who appears in three different roles in each 30-minute episode, playing everything from a stripper to a washroom attendant to a kleptomaniac psychiatric patient. The appearance of guest stars such as John Cleese and Bob Hoskins is also fun, and a few of the sketches are still enjoyable: my favorites are the send-ups of British warhorses like Brief Encounter and Private Lives. All five of the “Mrs. Bradley” mysteries, originally aired in 1998 and 2000 on BBC One, are included in this set. This is not the greatest series the BBC ever made, but it’s pleasant enough if you enjoy period mysteries (these are set in the '20s and '30s) or if, like me, you’re willing to watch anything which has Rigg in the cast. Mrs. Bradley is an interesting character who was positively groundbreaking in 1929 when she first began appearing in Gladys Mitchell’s novels—among other things Bradley is an unapologetic divorcée and a dedicated student of Freudian psychology—but the episodes are so brief (the first is 87 minutes, the remainder 56-59 minutes) that there's very little time for the cast to do anything but spit out the plot. Seriously, you can almost see the gears grinding as exposition is poorly disguised as conversation, incidents are presented with a wink, as if to say to the audience “bet you can’t guess when this will be important!”, and Mrs. Bradley moves things along even more quickly by directly addressing the camera. Still, the stylization is part of the fun and it’s easy to see Mrs. Bradley as the spiritual foremother of Mrs. Peel, making Rigg's casting in the role particularly appropriate. The technical quality of the transfers varies across the different programs included in this set, which is not surprising with television programs recorded over almost three decades. In general the sound is clear but the images are often soft and there is an unfortunate tendency for over-lighting in interior scenes, particularly in the Mrs. Bradley mysteries. These faults are not enough to keep you from enjoying the programs, but it feels like no one at the BBC was particularly concerned with seeing that they received the best possible presentation. Diana Rigg at the BBC includes two extras: a 21-minute sketch from the 1975 Morecambe and Wise Christmas Show (Rigg plays Nell Gwynne in a musical pastiche) and a 20-minute interview (also over-lit) which intercuts Rigg reflecting on her career with clips illustrating whatever she is discussing. The set also includes an illustrated booklet which provides a career overview of Rigg and notes on each episode included on the DVDs.